Busking in Maidstone Town centre to raise awareness of our beginners sessions starting in the new year. All the details are over on our website. Playing with a big band to kick off the Christmas light switch on celebrations in our home town of Paddock Wood. A short walk along the high street, through the market stalls to our main performance in front of the stage. A lovely warm and friendly atmosphere as everyone starts getting into the Christmas spirit. 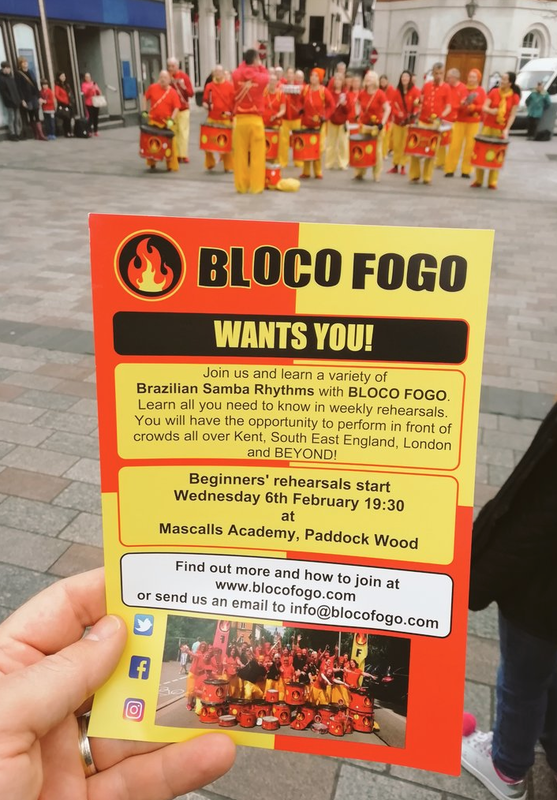 Loads of flyers handed out too for our new beginners sessions starting in the new year. Playing to thousands at West Malling’s Christmas lights switch on! Great to be back at Sandwich for their Christmas light switch on. We even had some snow ! Our first time at Barcombe for their Bonfire celebrations and what a night ! A wonderful and intimate evening with a great bunch of people, a very impressive bonfire and a superb firework display. We loved parading around the village and adding to the atmosphere of the night. Hopefully we’ll be back again next year.